English student teachers and some Year 7s jointly embraced the challenge of making a ‘Film in a Day’. An ever-fruitful collaboration between The Institute of Education (IoE) and London Nautical School (LNS) produced some truly imaginative, filmed responses to ‘The Rime of the Ancient Mariner’. Theo Bryer and Rebecca Wilson from the IoE and LNS English teachers Chris Waugh & Morlette Lindsay (also IoE), worked in partnership to create an intertextual learning extravaganza. Not only does use of one medium nourish the use of others, Chris claims that the nuanced meaning-making and sophisticated understanding evidenced by the boys’ films in some cases far exceeds that which could have been achieved with a written response. From the teachers’ perspective, although a 3:1 pupil/teacher ratio isn’t realistic in the real world, experience shows that with adequate logistical and pupil preparation in media-related projects, teachers could aspire to a facilitator’s role, choreographing groups rather than directing them. In this way, students feel the benefit of autonomous and sticky learning. As Chris pointed out on a subsequent screening day to all 130 student teachers and as Theo materially demonstrated throughout the 2-day stint, it takes a pioneering spirit to promote film making as an alternative means of showing understanding in traditional school settings.Both students and teachers were very much ‘in the moment’ during editing (see my posts on flow), making deeper and remixed reference back to the text. What more can an English teacher ask? Increasingly I think that digital editing not only provides a meaningful context for learning but also makes explicit a key 21st century competence: being discerning when it comes to making selections from masses of data. The boys’ films can be seen on Chris’s Year 7 blog. Here’s a short film of various moments in the day, showing salubrious levels of interaction between students and teachers. Rosen asks: who owns literacy? Michael Rosen’s posts are a constant source of inspiration and passionate entreaty. This one struck a particular chord: who indeed owns literacy? How is it being culturally mediated? If we can agree that literacy is a competence that enables those who have it to constructively participate in society (isn’t that the aim of most educational endeavour? ), we should come up with more child-centred ways of giving them access to it. They can experience what it feels like to be in control of a Wow Word Wall or a pupil-owned and edited collaborative blog. Teachers as skilled facilitators rather than deliverers of literacy, that’s what I’d like to see more of. See the full post here. 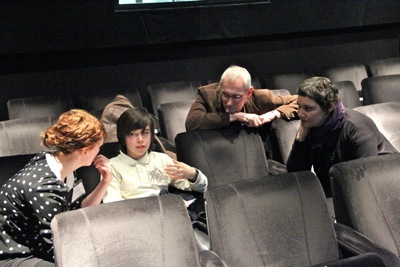 February 2012 – I gave a workshop at the Media Education Association conference held at The British Film Institute and the aim was to claim film-making as an art in its own right and to inspire teachers to inspire children to think like film-makers (although in this instance, and gratifyingly so, the children were inspiring the teachers). We looked at the various sociocultural benefits this might bring as regards living in a digital environment – both embracing it and in some ways mitigating against it by looking closely at the physical world as well as the affordances of the visual medium. From a fixed camera position: film a person waiting for someone who eventually joins him/her. Choose a location that enables an interaction between fiction and elements of reality. (1 ½ – 2 mins duration). Time allocation: 15 mins. Yours was refreshingly not about students and teachers doing media studies but rather about how film is used as a confidence booster, complimentary discipline and scope-widening tool for pupils all across the curriculum. The kids were a living shining example of how the arts can transform the level of engagement and learning potential of pupils – and if Aadi is the future of political thought about the arts then we are in safe hands! Thanks for these thoughts Mark!